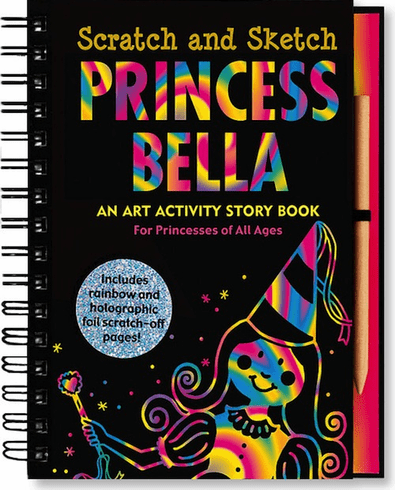 Trace the illustrations of Princess Bella and her adventures and watch her colorful story unfold. White outlines on black scratch-off pages create a fun way for younger children to trace illustrations. Shrink-wrapped with a wooden stylus for drawing on black-coated paper to reveal colors beneath. 64 pages. Includes 20 scratch-off, 20 illustrated, 20 sketch pages. 6-3/8" wide x 8-1/2" high; wire-o bound hardcover. Ages 5 and up.